Protecting your Missouri Driver’s License from points is what our attorneys do for you. Our experienced lawyers know that the best ticket defense starts with your first ticket. Contact the lawyers at Law Office of Kenneth P. Carp where our attorneys look at every traffic tickets individually and determine the best course of action for you. Moving violations can result in points being assessed against your driver’s license, which can result in your license being suspended or revoked, insurance rates impacted or your job being placed in jeopardy. Our lawyers know that good people can find themselves in a bad situation. Insurance companies who learn of your points can consider your driving records in setting your insurance premiums. Whether you’re a teen driver or an adult, prosecutors look at your driving record in assessing how to proceed on your current ticket, so resist the temptation to pay that “first” ticket. If you received a ticket call one of our experienced attorneys at 636-947-3600. We treat every client individually. Traffic ticket defense can be important for your employment. Employers look at your driving record even if you’re not driving for our job. Teachers, daycare workers, salesmen, the armed forces and many other occupations require their driving record to be reviewed. If it’s not this job, it could be the next one that reviews your driving record. Three of our attorneys have served as either a part-time judge or part-time prosecutors. We know the law and how to defend you as we protect your rights. Contact us at 636-947-3600 and let our attorneys defend your rights. 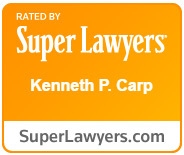 Law Office of Kenneth P. Carp are attorneys who work hard for you.